This Memorial Day Weekend Remember our Four-legged Veterans, too. 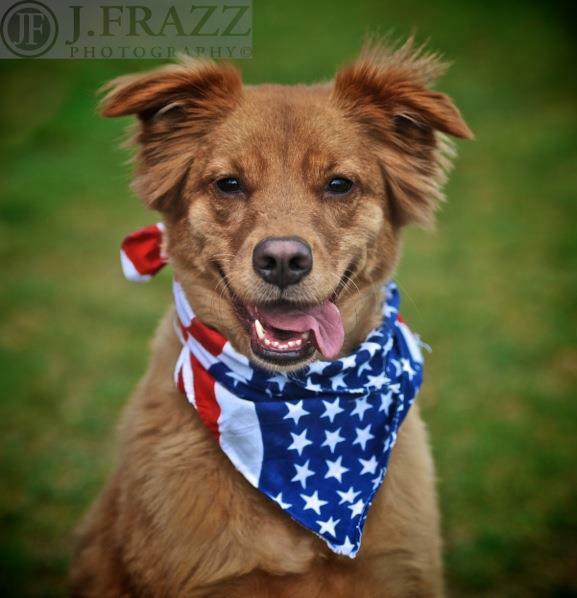 A Patriotic Pooch: Courtesy of Joseph Frazz Photography, one of the images contained on the pages of my soon-to-be-unleashed book, Dog’s Best Friend! Happy Memorial Day Weekend everyone. The following is a post I wrote four years ago. I established this blog in 2010 while writing my book Dog’s Best Friend: Will Judy: Founder of National Dog Week and Dog World Publisher (McFarland-July 2014). Long before the US Military utilized trained War Dogs, Judy educated Americans about all the ways dogs served humans militarily and therapeutically. Last year, the Friday before memorial Day, I subbed as a Fourth Grade teacher. The subject of the holiday weekend came up, and I asked the class what Memorial Day meant to them. Answers varied, but mostly the responses included, beach going, pool openings, sales at the Mall, and catching the newest Blockbuster. This is the generation that wasn’t even born when 9/11 occurred, and have little knowledge of what is going on around the world. Later, a father of one of the kids, a marine just back from the Mid-East spoke at an assembly. One kid asked, “Who is it we are fighting, exactly?” The father thoughtfully grappled with an answer, but couldn’t say exactly. His honesty was admirable. Memorial Day weekend reminds us to pay tribute to those who have made the ultimate sacrifices for their country, but many people aren’t aware of the important role dogs have played in our military history. During WWI, while European forces were already training canines to be official members of the war effort, a pit-bull mix named Stubby was paving the way for the future of American military dogs. Stubby, smuggled overseas by his owner, became a vital player in WWI, on and off the field. He received several honors, and medals, and was even promoted to Sergeant. For those who haven’t seen it yet, I highly recommend the documentary War Dogs of the Pacific. Produced and directed by Harris Done, it tells the amazing story of the bond that formed between a platoon of young marines and the dogs that were trained to serve them during WWII. I happened to catch it on the Military Channel. During that war, many “ordinary” dog owners donated their beloved pets to the war effort. Many never saw their dogs again, and soldiers, who became deeply attached to their dogs, had to relinquish them to their original owners at the war’s end. Many of these soldiers telling their first-person accounts have powerful memories of those events. Be prepared to be profoundly moved by their stories. If you have any doubt about how a dog can help a human, it will vanish. In 2009, Harris Done was presented with the Captain Arthur J. Haggerty Award from the Alliance of Purebred Dog Writers. The honor was presented by the Captain’s daughter, Babette Haggerty during the activities surrounding the 133rd Annual Westminster Kennel Club Dog Show. Captain Haggerty, who passed in 2006, was a great supporter, and promoter of Captain Will Judy’s National Dog Week Movement that was established in 1928 in an effort to honor the nation’s dogs, especially those military canines. Stories like these keep me motivated to write about how dogs really do make a huge difference in lives, on so many levels. Each day, someone new arrives on the scene with intriguing ideas, and information that keeps me inspired. Did you know that the patriotic Will Judy suggested that the pit bull be named the Yankee terrier? Perhaps they would have fared better in our society. Thanks for reading…Have a good and thoughtful weekend, and be safe! I started the week on an upbeat note with a post about National New Friend Old Friend Week (thanks to all who reached out and said hello), but I would be remiss if I didn’t point out that this week is also designated as National Dog Bite Prevention Week. I always find it a little depressing that in researching National Dog Week, a positive event, I always find more links to the former. So many of us know of someone who has been bitten by a dog. According to the AVMA, on average, 4.7 million people are bitten by dogs in America each year, and most of these victims are children and seniors. And contrary to what you might think, most of these bites are delivered by a familiar dog, often occurring during everyday interactions between pet and human. I know people who, once bitten by a dog, are afraid of canines for years to come. I also know children, who despite a terrible encounter with a dog, remain steadfast lovers of them, going on to own several. When a dog bites, it can bring terrible implications for the owner of the dog, too. What do they do now? Some ignore it, or pretend to, hoping for the best, but always worrying about the possibility of a repeat incident. Some, facing the problem head on, consult a veterinarian, often discovering that the dog is suffering from a medical condition that may require it to be euthanized for the safety of all concerned. Then there are legal consequences that differ from state to state, making some dog owners liable for the behavior of their dog. So how do you prevent dog bites in the first place? Use some common sense. Never leave children alone with a dog, no matter how “nice” you think the dog is. If a dog is getting on in age it might be experiencing physical pain its owner is not even aware of. Some older dogs are hard of hearing, and are startled into biting as a defensive measure. Remind your children not to approach dogs that are tethered, or in cars. Don’t encourage rough play with dogs, like tug-of-war, or wrestling. If someone warns you that their dog is aggressive, stay away and don’t pretend to be the Dog Whisperer, and dog owners should always keep dogs on a leash, especially in public places, and don’t rely on retractable leashes, they are not foolproof. Remember, dogs have those sharp teeth for a reason; in a far off time, and place, they relied on them to feed and protect themselves. The better we breed, socialize and train our dogs, the better we can coexist with them. And on a lighter note, this week also brought us the birthdays of Blue Jeans, and the Speeding Ticket, as well as Fountain Pen Day, and U.S. Public School Day. As the year grinds down, I’ve stepped in for many tired teachers, subbing at a difficult time of year for all. It’s hot, the school day was longer this year, and with so many teachers retiring, or being laid off, it gets a little wearisome. I like to try to do something fun and different when I teach. For example, kids love to talk about dogs, even without any prompting. Last week I had them make postcards for the Pet Postcard Project launched by Nikki Moustaki (more to come about that). Discussing dogs can bring out the talk in even the quietest among the class. Usually it’s about fun things we can do with our dogs, but many times, kids share their feeling about the loss of a family pet, and often it is their very first experience with grief. No matter how the day, or week goes, I always manage to get a good laugh from one of the kids, and end our time together on a high note. The other day, while completing an assignment that had students make a “to do” list, one second-grader wrote: 1. Chew gum, 2. Chew another flavor of gum. I never did find out what flavors were involved, but I liked the simplicity of this, and I think he’s got the right idea! As a Blogger, one of the things I enjoy most is discovering occasions that make us stop and think about things we might take for granted. Who thinks up all these weeks and months dedicated to almost everything imaginable? National Dog Week we know was started in 1928 by William Judy (although I still see a lot of misinformation floating on the internet about that), and someone by the name of Dr. Jan Yager started National New Friends Old Friends Week in 1983 as a way to encourage us to reconnect with our “old” friends, and welcome the new. The week, that begins with the Sunday after Mother’s Day, reminds us all of how vital our friends are be they casual, and newly “acquired,” or close, the result of a lifetime of experiences. Having joined the Facebook generation, I have become reconnected with so many people, and have come to be acquainted with many more new “friends” in three weeks that it is overwhelming. Interestingly, many of my closest friends are not registered on the site, and have made it clear they never will be. I’ll keep inviting them anyway! It seemed fitting that when I learned about Dr. Yager’s week of the friends, I could relate this to the brave new world of social networking, that is both a curse, and a blessing. It’s sort of like a surreal dream, in a ten minute session, your lifetime experience becomes compressed. High school and college classmates, past coworkers, customers, family, there they are, all beeboopin’ and scattin’ all over your Wall! Sometimes it makes you groan, but most times it brings a smile, and a much-needed laugh. Whether you hate social networking, or love it, it has definitely changed the way we connect. And of course, I need to relate this subject to the pets in our lives. It got me to thinking about all my friends who have, while mourning the loss of a dog, have uttered the greatest untruth known to mankind, “I will never have another one.” My friend Gail Alverson, of Quintessential Quilts, said that very thing when she lost her beloved Yellow lab, Boomer. When Boomie passed, she lived that “lie” until one day, while minding her booth at a Craft Show, was befriended by another Lab that was in need of a new home. Gail paid the adoption fee, and drove home with Molly without telling her husband, Jim! Molly has been part of the Alverson family for several years now. And then there’s Elsa and Barb, of Tempest in a Teapot, designers of fine outdoor art. After the loss of two dogs, they also declared a time out. But not long after, while minding my own business at an art show, Elsa and Barb brought Lulu, newly acquired through the Petfinder.com site, to meet “Aunt” Lisa. But my friend Jeanne, who always likes to have two dogs, is taking a different approach, already planning for her next pooch when her aging Beagle, Bailey, goes to his hunting spot in the sky. Of course, her husband John does not know about this, nor does he seem to have any choice in the matter. It’s true, dog-lovers are forever. One of the hardest part of pet ownership is experiencing the loss of a beloved animal. We help heal when we nostalgically recall the chapters of our lives, gazing at old photos of our pets, and telling those “remember when” stories that connect us to our pasts. Most people who are grieving over the loss of a four-legged friend really don’t want to go through the pain again. But they will. Because we know that somewhere out there, we can begin a new journey fueled by the eternal love we have for our animals. With a trip to the breeder, a shelter, or by divine intervention, we can welcome a new furry friend, while honoring those of the past. So thank you Dr. Yager, for giving us this week that makes me “paws” to find yet another way to show how our animals really can be our best friends, helping us to connect with other humans. Attention all dogs, and their owners, warmer weather, and longer days are here, and it’s not a time to “Sit, or Stay!” Jump off that sofa, get outside. Bike, run, play frisbee, Rollerblade…but whatever you do, be sure to capture the moment in a great photograph of your dog in motion (and if you want to put yourself in the picture, that’s fine, too). The deadline for entries is May 30th. Prizes will be awarded to the top three winners. Thank you for all of you who have responded to my post about Service Dogs in the classroom, especially when it pertains to those who have children diagnosed with autism. I will continue to share your stories. Also, please watch for a Newark Pets Examiner feature on Nikki Moustaki and her amazing Pet Postcard Project that is raising funds to feed the nation’s homeless animals. Nikki will have an exciting announcement about a new project very shortly. 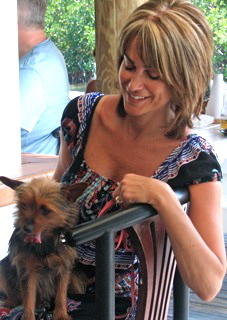 And on a lighter note, an article, and post about J Mikel Sacher and her upscale, and all-natural line of pet grooming products(http://www.shop.furdogsnyc.com) will be unleashed soon. Dog breeders, and dog trainers like to remind us all that dogs are not our children. But most of you have dogs, and cats, probably think of your pets as part of the family. Pets, especially our dogs, are in many ways, perpetual four-year olds, constantly in need of our services in order to survive, and in their advanced age, need us even more. And in many ways, our pets may be easier to love, from what I hear. It happens all the time, wherever I go, people seem to be talking about…. their dogs. At bars, restaurants, and teacher’s rooms, woman, and some men, often talk more about the dogs of their families than about their kids! It isn’t that they don’t love their kids, but talk of them sometimes brings up stressful topics about difficulties involving them, something that talking about dogs does not. Along with the talk, comes pictures in wallets, and on cell phones. One women I spoke with recently, had more photos of her dog than of her children! Tomorrow is Mother’s Day, a day to celebrate the mother’s of the nation. And there go those show off dogs again, during National Dog Week, they get a full seven days of honor in September (see what I mean). But tomorrow, I would like to give humans their due, and write about some special mothers that I know. My own mother for instance, someone with great style, and sense of humor; her house was always filled with great food, lots of laughs, and pets a-plenty. At any given time, there was either a turtle, snake, or gerbil, on the loose, and a cat happy to help look for them. She always encouraged all of us to pursue our dreams and thought it was great that I left a good job in New York to become an artist. Then there is my mother-in-law, Charlotte. She will turn 94 in July, and still drives a sports car with a spoiler and goes to AC! Charlotte always had a dog and loves to reminisce about each one. My sister, Manette, documentary film maker, and mother to handsome Zac, who she raised as a single mom, my sister-in-law, Gigi, FIT Grad, and fashion designer turned stay-at-home painting mom to four beautiful and kooky kids. And I extend my Mother’s Day greetings to all my friends and their terrific kids who call me aunt, and my friends whose children are more of the K-9 or Feline kind! In 1949, Will Judy, founder of National Dog Week, commented on the stigma his society placed on childless women who mothered their dogs when he wrote in their defense, “…some of the women cannot have children;…some of these women do not have husbands.” He went on to write, “If you can’t have a child, have a dog. If you can, have both of them.” I like his style! It’s Be Kind to Animals and National Pet Week! John Kremer’s newsletter tells us that today brings the 4-H Club Birthday (a group that definitely promotes kindness to animals), a sobering look back in history with the Kent State Student Memorial Day, and the absurd, Highway Wedding Day (I can’t find anything about this one, sorry, but I’m sure you can make up some fun scenarios). But to stay on topic, I’ll focus on the pets, and animals in our lives. Be Kind to Animals Week was initiated way back in 1915, by the Humane Society. The week helps to get the message out to young people to speak out for animals, report animal abuse, and to appreciate wildlife. With the sad news of the BP oil disaster in Louisiana, it’s a perfect time for educators to teach children about the impact humans have on the environment, and the disastrous effects it can have on animals. National Pet Week was launched in 1981 by the American Veterinarian Medical Association (AVVMA). This year’s theme is “Pets and People-Healthy Together” bringing to light the obesity epidemic among the American pet population. I will be writing more about these two observances for the Newark Pets Examiner later in the week. While on Facebook earlier today, I discovered a page just for Portuguese water dogs. As you probably know already, I have an eight year old “Portie” named Hooper. Hooper is a piece of work. Recently, a kid who spent the day with her told me, “your dog is like a little person in a dog suit.” My first article for the Examiner.com was titled “At Home with a Portuguese water dog.” You can still read it by going to my Facebook Page or googling Newark Pets Examiner. That’s Hooper in the photo. Anyway, when I went on the PWD Facebook page, I was excited to see that my article was displayed there! I also learned about an author, a fellow-Examiner, who wrote a children’s book about Porties, something I hope to learn more about. As for my writing experience, it continues to travel a twisting path. Each week, I am sending out more requested material, chapters, proposals; discussing options. In the meantime, another project I had placed on hold, while I “went to the dogs,” has received some attention. As a writer, you never know what you are going to find in your in-box each morning, sometimes it’s like being in a House of Horrors, and some days it feels like the Fun House. You never know what’s ready to jump out at you around the corner. You just have to be prepared. Which reminds me, the deadline for the Lorian Hemingway Short Story Competition is nearing. I have a nice entry this year, and yes, it’s about a dog! 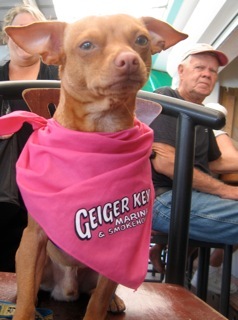 Yesterday, as we worked on our boat down at Maritime Marina, in Tuckerton, owned by our niece Gail Hansen, and her husband, Erik, I asked where Ginger was. Ginger is the largest, sweetest Golden retriever I’ve ever met. Gail explained it was too hot for Ginger, and that a melanoma had just been removed from the dog’s leg; things didn’t look good. I can’t imagine the marina without this loving, happy fixture greeting everyone at the entrance, and this summer I won’t take that for granted every time we get to see her. This week it’s National Pet Week and Be Kind to Animals Week. I’ll be talking more about these two observances in this week”s Newark Pets Examiner posts. For now, in honor of all the pets that have graced my life, I’m reprinting the “Dogs in Heaven” post written in January… Give your pets a little extra love this week. Growing up in my family was sometimes like growing up in a menagerie. My sister, Manette, brought the horse, (when we lived in Boulder) my brother, John was our tropical fish and reptile guy, I specialized in dogs (a duck, some gerbils and white mice, and a bird or two), and my brother Matt, despite his nickname of “Matty Dawg,” was our cat man. I recall many years ago returning home on a college break only to be warmly greeted by a young grey Tiger cat. Matt, then 12 or so, had asked my parents for a kitten. Upon answering a classified ad, Matt returned not with a tiny kitten, but this nearly full grown cat. My family was disappointed at first, but not for long. Matt named the cat Morrison after Jim Morrison of The Doors, Morrey for short. Morrey quickly won everyone’s affection, and became one of our family’s most beloved pets. He was a big cat that liked to wander, returning home each morning with battle wounds from the night before. But with humans, he was gentle and attentive, the kind of cat even people who didn’t like cats came to love, a cat that behaved more like your typical dog. Morrey lived to be 19, which is remarkable for the life he led. There were other cats in our life, Gypsy (who came with four siblings, dropped off in a duffel bag), Jefferson, Metal, Tripod, Veda, and Pita who is still enjoying a restful old-age up in Hackensack, but Morrey was The King of Cats, in our family’s pet history. If Matt was still with us, he would have turned 44 today. He was, and always will be, our “baby” brother. Matt was born during the Year of the Horse, and like a horse he was strong, independent, always at your service, reliable, and sometimes a little wild. A champion of the under dog, Matt always went out of his way to help those less fortunate than he. Will Judy believed that there was room for dogs in heaven. As the editor-in-chief of Dog World, he was once asked that question by a young reader, a 10-year-old boy who was upset at being told by his teacher that dogs did not go to heaven because there was no room for them. Will Judy, trained for the clergy, never lost his sensitive touch. He had great respect for children and assured this reader that dogs had a special place in heaven because it would be a lonely place without them. I like to think that there is plenty of room for every pet up there, and that Matt, Morrey, Coco Puff (our tormented toy poodle), are all together, enjoying the company of others who loved their pets, and still do.